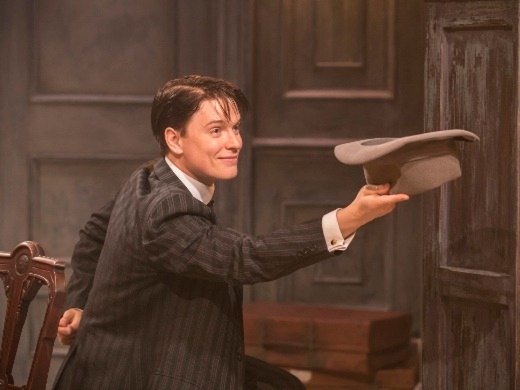 Tom Stoppard’s dazzling comedy of art, love and revolution features James Joyce, Tristan Tzara and Lenin as remembered - and misremembered - by Henry Carr, a minor British diplomat in Zurich 1917. When Gwendolen and Cecily wander in from The Importance of Being Earnest Henry’s mind wanders too. He knows he was Algernon in a production in Zurich. But who was the other one? The original production of Travesties won the Evening Standard award for Best Comedy and the Tony award for Best Play. 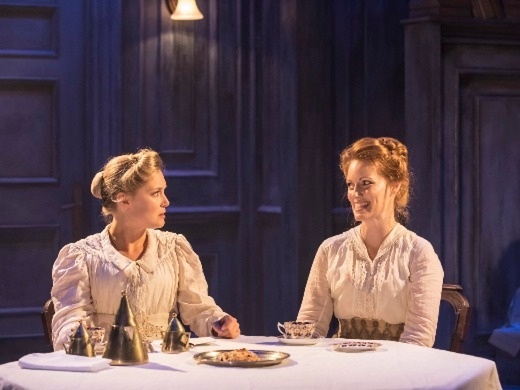 This first London revival in over 20 years is directed by Patrick Marber and starring Tom Hollander, Freddie Fox, Peter McDonald, Clare Foster, Forbes Masson, Amy Morgan, Sarah Quist, Tim Wallers. Tom Hollander, Freddie Fox, Peter McDonald, Clare Foster, Forbes Masson, Amy Morgan, Sarah Quist, Tim Wallers. You will receive a confirmation email with your booking reference. If you choose collect at box office please print this and bring it with you on the day of the show a minimum of 30 minutes before the performance start time. 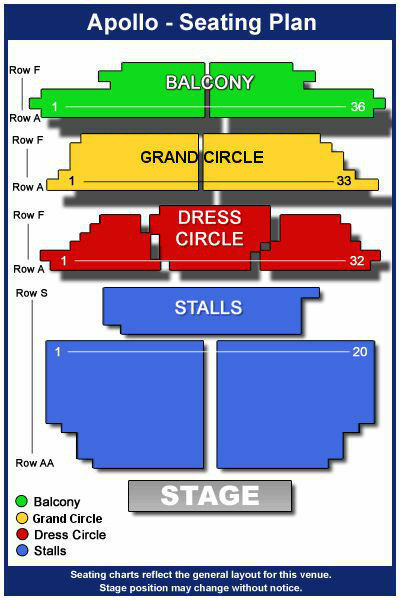 Apollo Theatre, Shaftesbury Avenue, London, W1D 7ES. 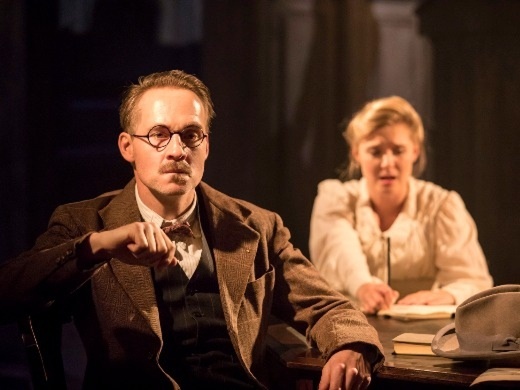 Travesties is stunning theatre. I brilliant script brought to life by consummate actors. An evening of delight. Tom Hollander was beyond magical!! Everything from the entire cast, to the staging and of course the writing by Stoppard made this truly one of the best productions I have ever seen. So lucky to have gotten tickets before it sadly closed. Bravo!!!!! We really enjoyed this play. All the cast were great but we must single out Tom Hollander who was simply magnificent! What a pity it finished yesterday as we would have loved to see it all again just to be sure we hadn't missed anything. A fantastic production- witty, sharp, sparkling with perfect comic timing. Tom Hollander and Freddie Fox excelled in the confident quickstep of their rapid-fire repartee. If I could have improved one thing, it would be the diction of the actor who played James Joyce- lyrical brogue is required for this part, delivered with perfect clarity and this was occasionally lacking, especially when rapid delivery was required. Notwithstanding this, a splendidly enjoyable evening and well worth our trip from North Yorkshire to see. I went In a party of 6 - my husband, two sons and their partners. We enjoyed it enormously, but had to concentrate very, very hard! It is typical Stoppard, very wordy, and we were all impressed with Tom Hollander in the main role, - we had only seen him on TV before, and he really has to carry the first 20 minutes on his own, with a cold audience - very well done. At the end of the show I couldn't really remember what it had been about. Great show. Superbly paced and very funny. Tom Hollander was terrific, but the whole cast were very strong. Absolutely brilliant...the energy and comedic performance was amazing. Every actor was worthy of praise and the pace was excellent. I would recommend anyone to see this. A wonderfully enjoyable experience. A brilliant cast - great fun to watch. The energy levels were astounding. Brilliant play. As entertaining, funny and clever as it was first time round. Excellent performances all round but particularly Tom Hollander. Can we now please have Arcadia back again? Brilliant acting, amusing script, Oscar Wilde esque in parts. Story jumps around a little too much for my taste, giving different slants on memories I presumed. However, well worth seeing, some knowledge of The Importance of Being Ernest came in handy! Everyone brilliant, very funny, well staged. Utterly brilliant. The play is terrific anyway, but the entire cast was excellent and the directing was superb. Excellent choice of play for 2017. A stunning play, we enjoyed every minute of this exhilarating, stimulating play. A wonderful piece of theatre. The performances were riveting. Thought provoking and yet the production was also very entertaining and comical. Most enjoyable even if you did not get all the historical and literary references. A great production. What a tour de force! Not a weak link in casting, performances, plot and dialogue. We were completely enthralled. One of the best evenings at the theatre ever. We waited in vain at the stage door to congratulate Tom and get his autograph; however we did get Julian Fellowes! Andwere able to congratulate the rest of the cast.J.S.J.S. A superb revival of one of Stoppard's greatest plays! This was crackling, energetic, pulsating theatre, with some beautiful individual performances. Not to be missed! Fabulous production with some outstanding performances. Tom Hollander was amazing - acting to the end of his fingertips! Brilliant. Loved it. One of the best pieces of theatre I've seen in ages. Everything was perfection. Script, set and acting. The best play I've seen for ages! The play was fantastic - every single member of the cast was hilarious and awesome. Freddie Fox was a particular highlight. From the first line, you'll have to pay close attention to keep up with what's happening in this fast-paced yet thought-provoking alt-historical comedy-drama. Set in Zurich during WW1, the play loosely follows Henry Carr, a minor British diplomat and also sometime friend to Lenin, James Joyce and Tristan Tzara (the dadaist), or so he thinks. The play is quick-witted, leaping from dance scenes and clever limerick wordplay to thoughtful recreations of Lenin's flight to Russia. Tom Hollander is a joy and brings the role alive. With heavy homages to Oscar Wilde's "The Importance of being Earnest", this is Oscar Wilde with meaning, questioning the such things as the importance of art, and which trousers to wear to dinner. I enjoyed the show, we had great seats with no body behind us. We could see the stage quite clearly and felt that we were near the actors. Freddie Fox was brilliant. The cast were brilliant too. It is a shame it had to finish next Saturday. Would love to see it again. 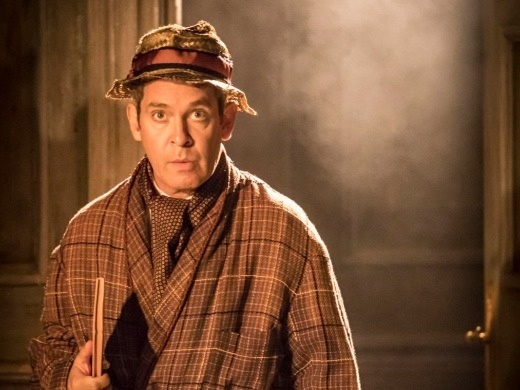 Patrick Marber's cast, led by the always-excellent Tom Hollander, perfectly captures the essence of Stoppard's glittering, brilliant text in this revival of Travesties at the Apollo. Hollander's creaking, marginal figure of Henry Carr invites his audience back a hundred years to neutral Switzerland, to debate the still-relevant question of whether 'art' can, or should, be considered Art in an age of industrial warfare and revolutionary politics. Who, in 1917, could've anticipated the Bolshevik revolution from the image of Lenin in Zurich in 1917, a 'mighty oak from a corner room'. Certainly not Carr, who still appreciates the cosmic irony - while his unusually engagee butler, Bennett, turns out to be more astute. Freddy Fox's turn as the young Tzara starts out almost too maniacal to follow, but finds his pace. The send up of the 'Gamorrah-ist' Oscar Wilde's Importance of Being Earnest tea party with Clare Foster's Cecily and Amy Morgan's Gwendolen, to a strummed guitar accompaniment by Peter McDonald's James Joyce, is an ironic joy, while Foster's foxy librarian showgirl showtune stomp is a comic tour de force. My advice: Get tickets while you still can. You make me pay £75 for a ticket and you want a free review! Well, it was a brilliant production. If you want more, pay me! Excellent, if you have a good view of the stage (see below). I attended a matinee performance of Travesties, which was generally excellent, except the last few lines which were drawn out too long. A beautiful theatre, but the bar facilities appeared meagre, especially the grand circle bar, which had only one chair. Overall there could be more sofas / armchairs around the place for patrons to sit during the interval and enjoy their theatrical experience. Otherwise it feels like a conveyer belt, where customers are moved on without a feeling of having been welcome. Brilliant. All the actors were amazing, but of course especially Tom Hollander and Freddie Fox. I don't know how they even learned the lines, let alone deliver them so quickly and comprehensibly and convincingly and well - or how they do it every night, let alone twice on Wednesdays! We saw it on Wednesday afternoon and it was fantastic. An excellent performance stolen by the Bulter who certainly gave as good as he got - if not better - from Stoppard's very challenging and intricate script. A wonderful revival cannily directed with a strong ensemble lead by Tom Hollander. From Henry's opening monologue to the final flourish the production is fun and clever, comletely absorbing. Terrific entertainment. A thoroughly enjoyable play, with excellent performances from all the cast. Would definitely recommend this play you will not be disappointed. Excellent production with outstanding performances by all members of the cast. We have recommended this to our family and friends ans one of the best performances we have ever seen. Enjoyable , thought-provoking and highly memorable ! Not Stoppard's finest, but an interesting vignette on a slice of history. The cast were all right, but the production needed a bit more oomph. Enjoyed Lenin and the butler the most. Of course the one-liners and limericks were funny. Brilliant writing and prolific delivery. All the cast were superb, with Tom Hollander giving a virtuoso performance with a seemingly endless ability to change mood and tone. I cannot praise it enough. If Stoppard had written nothing else he would still be a leading playwright. Enjoyable journey with one man and his memory of past times. Great performance. Great feeling for the atmosphere of the era. I enjoyed seeing this production, and was glad to reacquaint myself with a play I saw at it's premiere , which reminded me how brilliant it is! We have long been fans of Stoppard and saw Travesties several times in its original production with John Wood in the title role in 1975. This production did not disappoint, being lively, fast paced and as exciting as the original. Congratulations. What a joy! Tom Hollander has never been better and the entire cast was excellent - funny, quick-witted and always topical. The play was very clever and amusing, but I found it rather dry without plot or much emotional human interreaction. Tom Hollander was excellent, but I found the 3 people in Zurich caricatures.